NEGROMANCER 2.0: Kathryn Lance Talks the Close of Her Pandora's Trilogy, "Pandora's Promise"
Kathryn Lance Talks the Close of Her Pandora's Trilogy, "Pandora's Promise"
According to her website, Kathryn Lance (KL) has been both a professional writer and a ghostwriter of fiction and nonfiction. She has also been an editor, a writing instructor, and a writing consultant. She has authored more than 50 books and also written hundreds of articles. Lance's most recent work of fiction is the recently released novel, Pandora's Promise. This is the third book in her Pandora's trilogy, a science fiction adventure/romance series that takes place in a future world devastated by a recombinant-DNA disaster. The first book in the series, Pandora's Genes (Questar, 1985), won Romance Times' “Best New Science Fiction” award in 1986. Pandora's Gene also made Locus magazine's “Recommended List” in 1986. The second book, Pandora's Children (Questar 1987), continued the story begun in the first book. 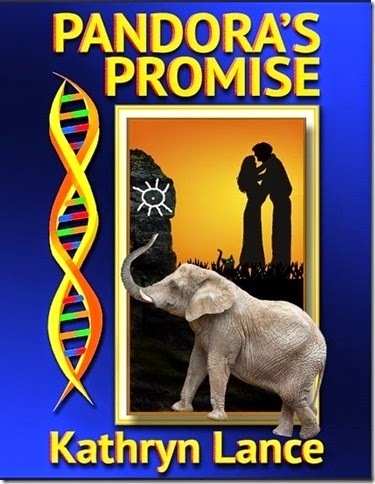 Pandora's Promise, which stands alone as a novel, features telepathic elephants and an intense and unusual love triangle. KL: For me, the best thing about being a writer of fiction is that I get to make up whole worlds and get to know the characters who inhabit them. I say “get to know” the characters because, although they are obviously a product of my mind, I always feel that the characters are real people. This has been especially true of the characters in the Pandora’s books, who seem every bit as real to me as my actual friends. It’s very hard to let them go, as their stories continue in my imagination. KL: I’m taking a break from long fiction just now and working on my writing and nature blogs, as well as a couple of articles. One is about the current book, which is my “encore” book, since the first two novels were published in the 1980’s! Q: Where did you get the idea for the Pandora’s Trilogy? KL: Years ago I read an article about attempts to clean oil spills using genetically-modified bacteria. I thought, “Great--but what if your car catches it?” From there I began to wonder what would happen if all oil and oil products abruptly disappeared from the earth. Later on, I had a dream in which I saw a good man who was about to do something he knew was morally wrong, but that he felt he had to do. The man turned out to be Zach, and his conflict between honor and duty is what drives him throughout the series. While writing Pandora’s Promise I was surprised to learn that Zach’s conflict could be resolved. Q: What do you say to potential readers who say they don’t like science fiction? KL: I say, “I don’t think science fiction is what you think it is.” I have adored science fiction since I was a child. It is interesting and exciting because it answers questions that begin “What if?” and it takes on societal problems in a way that mainstream fiction usually does not. (Think of 1984 and Brave New World.) Science fiction has always seemed more real to me than mainstream fiction. Though the genre has a reputation for being less-well-written than some other genres, that is not true. As with any fiction, some is good, some is bad, some is indifferent. To me, the story and characters are always the most important elements, whatever the category of literature. Q: How did you create the elephants? Q: Is Pandora’s Promise also a love story? KL: The whole Pandora’s trilogy is a love story, though I did not know that until the first book, Pandora’s Genes, won the “Best New Science Fiction” award from Romance Times in the year it was published. The series portrays a love triangle featuring the two male protagonists, Zach and Will, who both love Evvy, the young girl scientist. Although the love story is never in the forefront of the action, it is always in the background, and I’ve heard from many readers who had definite ideas how they wanted it resolved. Q: Will I understand Pandora’s Promise if I haven’t read the other two novels? KL: Definitely! I wrote it in such a way that you needn’t read the first two books to follow what is going on. Several readers who started with this book told me they liked it so much that they went back and read the first two novels just to spend more time with the characters. Pandora’s Promise, the long-awaited conclusion to the trilogy that began with the award-winning novel Pandora’s Genes, takes place in a world 100 years after a recombinant-DNA disaster destroyed all oil-based technology and caused widespread mutations. Due to an inherited genetic disease, the human race seems doomed to extinction. In this dangerous setting, Evvy, the brilliant young scientist trying to save humanity, sets out on a perilous quest, while Zach, the poet-warrior and Evvy’s self-exiled soul mate, faces deadly challenges among disparate human and animal societies. Unknowingly, both Zach and Evvy follow clues to the mysterious Eye--a source of hope? Of oblivion? Or merely a myth? With this final volume in the trilogy, author and SFWA member Kathryn Lance answers all questions raised by the first two books while creating a stand-alone page-turner that explains how the initial disaster occurred and resolves the unusual love triangle involving Zach, Evvy, and Will the Principal, the charismatic but flawed leader of a society based in the ruins of Washington, D.C. Along the way readers are introduced to fascinating future societies, including the southern “Snake People,” who worship a genetically altered giant constrictor, The Pros, a group of farming communities whose society is built around a violent sports contest, and The Dream Tasters, a canny and loving group of empathic elephants.